We hope you enjoy our FREE Autumn Mindfulness Hunt. Get outside and connect with nature! Download our FREE Autumn Mindfulness Hunt now! 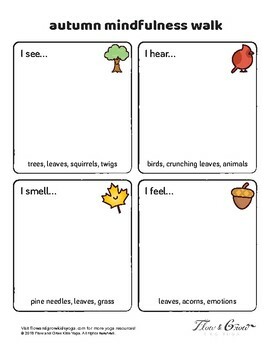 Ask the children to use this worksheet to to record what they SEE, HEAR, SMELL and FEEL as they walk outside on a nice Autumn day. Take a moment to tune in, breathe, and just be. Give plenty of time for students to draw or write their findings. Come together as a group and find out what people observed and any impact it had on them.